O18’s Brenda di Lammermoor or is it Laurent di Lammermoor? Lucia di Lammermoors are often best known for the sopranos who played the role of Lucia, and thus, the famous mad scene. I have suggested that it might be helpful to just name each production of this very popular opera for the soprano. In this case, Brenda Rae plays Lucia, so to aid our memories why not simply call it Brenda di Lammermoor. Think how much easier it would be to remember which Opera Philadelphia Lucia that you saw or to find articles in Google on this production if it was so named. However, my plan hit a bump with this production. There are two prominent stars for this presentation. As I will discuss more, Director Laurent Pelly’s fingerprints are all over this edition. This one should also have an alias, Laurent di Lammermoor. Lucia played by Brenda Rae. Photo by Steven Pisano; courtesy of Opera Philadelphia. If you don’t know the story already, Lucia falls in love with and pledges herself to Edgardo from a rival family. Edgardo is the arch enemy of her brother Enrico who now heads her family. Enrico desperately needs her to marry Lord Arturo to save the family from ruin. With deception and pressure, he forces Lucia into the marriage. Edgardo, who has been on travel, finds out and believes his betrothed has deceived him. Under the strain, Lucia becomes unhinged and, well, lots of bad things happen. The composer is Gaetano Donizetti and the librettist is Salvatore Cammarano. This singing is bel canto and the music is a crowd pleaser. However, key to your response to this opera is how you feel about Lucia. l: Lucia (Brenda Rae) has been summoned by Enrico (Troy Cook). r: Edgardo (Michael Spyres) and Lucia (Brenda Rae) sing of their love. Photos by Steven Pisano; courtesy of Opera Philadelphia. My wife and I attended Friday night’s opening performance after attending Thursday night’s opening of Sky on Swings, the first of O18 Festival productions. With Sky, Opera Philadelphia pushed into contemporary opera, facing a current topic head on. With Lucia, they probe opera’s boundaries more modestly by giving us a classic opera in a new dress and new shoes and new accouterments. What you make of that might very well depend on whether you have seen Lucia before, especially a version you are fond of. This was my wife’s first, and she became immersed in the story and enjoyed it. 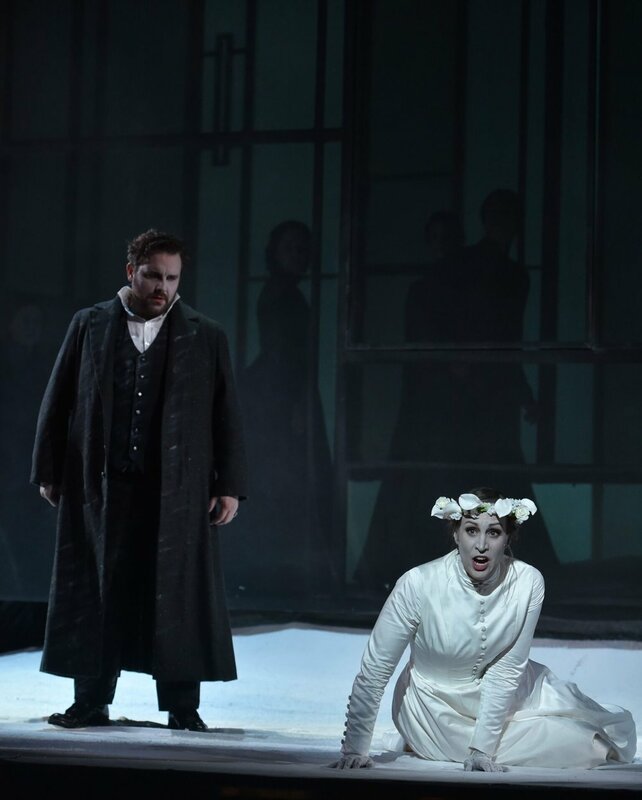 I have seen Lucia a couple of times before, and while I enjoyed this OP performance, I viewed it more like I was going to see what Christmas decorations Saks has in its windows this year. So even for the marvelous Ms. Rae who sings beautifully and played the mad scene to the hilt, I was not emotionally involved, but simply looking on as though I was watching an Olympic diving competition (I gave her a 9.0; I’m easy). Too bad really, because seeing Lucia should be a highly visceral experience. l: Raimondo (Christian Van Horn) instructs Lucia (Brenda Rae) to marry Arturo. r: Arturo (Andrew Owens) is greeted by Enrico (Troy Cook). Photos by Kelly & Massa; courtesy of Opera Philadelphia. There is lots of other good stuff in this production as well as the mad scene. Opera Philadelphia brought in the singers to match the reputation of the in-demand director, Mr. Pelly. As stated already, Ms. Rae is certainly worth seeing and hearing; her ability to sing naturally while standing, sitting, or lying prostate is amazing. Personally, I loved all the voices and liked the singing very much. 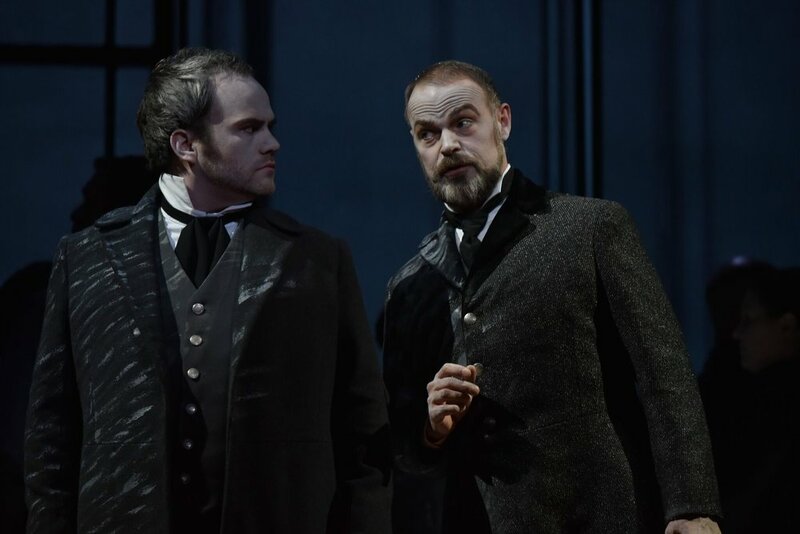 Tenor Michael Spyres was a fine Edgardo and baritone Troy Clark was an edgy, self-interested Enrico that you could easily dislike. I find the role of the chaplain Raimondo to be one of the more interesting; it’s never quite clear whose side he is on, stability I suppose. 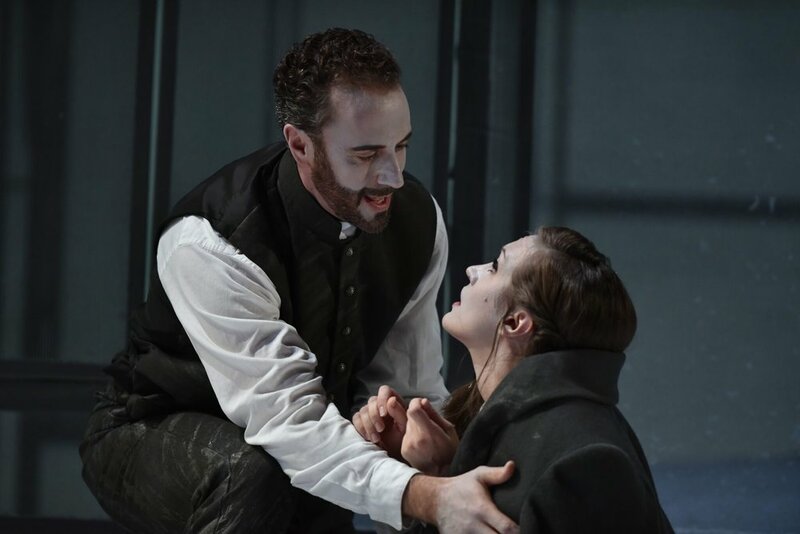 Christian Van Horn who plays him has a stage-commanding bass-baritone voice; he recently won the 2018 Richard Tucker award. I was also impressed with Andrew Owens in the relatively small role of Arturo; he has a beautiful tenor voice that I’d love to hear more of. So, if for no other reason, go to hear this excellent group of singers in a great opera. 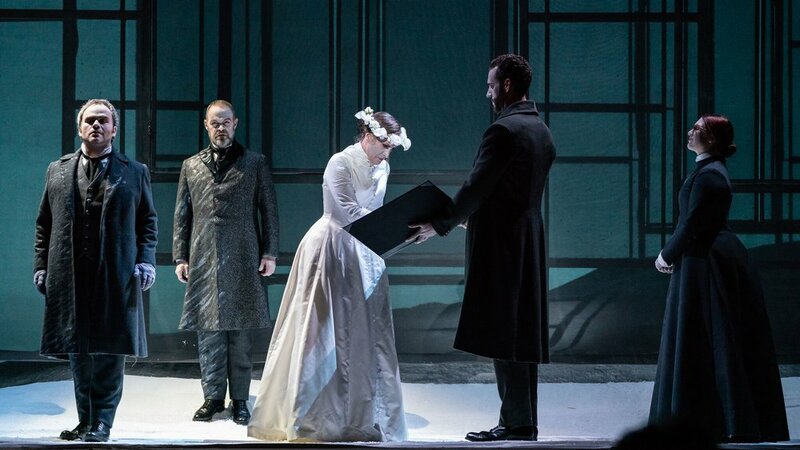 l: Arturo (Andrew Owens) and Enrico (Troy Cook) look on as Lucia (Brenda Rae) signs the wedding contract held by Raimondo (Christian Van Horn). r: Edgardo (Michael Spyres) arrives and denounces Lucia (Brenda Rae). Photos by Steven Paisano; courtesy of Opera Philadelphia. Another good thing about this opera (and I’m not including the music) is getting to see it through modern European eyes. This Lucia is a collaborative effort between Opera Philadelphia and Wiener Staatsoper and will play next in Vienna. This production isn’t wild like some European productions, but it does have a chic style that I associate with Europe. It’s also clever. 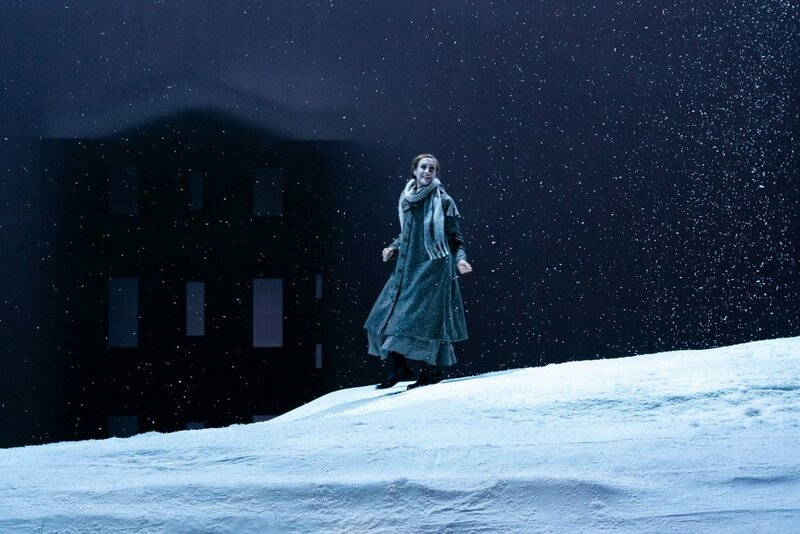 A snow-covered hill on stage has to be worked around all evening and manages to provide the staircase that Lucia is supposed to enter for the mad scene. The walls of estate are see-through screens. The lighting plays with our emotions using colors and shadings and plays with our eyes using perspective to make a mansion appear at different distances in the background. There are a few surprises I won’t disclose. It’s all very fun to watch. But it never really engaged me in the drama, and I was looking forward to that. Mr. Pelly and Ms. Rae have turned Lucia into a basket case from the get-go, starting with the death of her mother. Enrico was blinded by his desperate situation and did not see her breaking down, but I wondered why Edgardo does not see this and back off. The Lucias I have seen before were initially stable women who were pushed too far; the psychotic break comes as a bit of a shock. I wanted to call a doctor for Ms. Rae’s Lucia within a few minutes of seeing her contort on stage. And then when she went mad, I wondered where she found the strength to strike back. I know everyone wants to put their stamp on a performance but I’d like to see Ms. Rae again as a more traditional Lucia. Lucia (Brenda Rae) has gone completely mad. Photo by Kelly & Massa; courtesy of Opera Philadelphia. Ah yes, the music. Conductor Corrado Rovaris has gotten high marks in the professional reviews I’ve read (see listings in sidebar), but I was found the performance to be unremarkable. The sound seemed thin and for me seemed mostly reactive to the emotional turmoil on stage, not really a player in the opera. Perhaps I need to give it another listen, and I offer a few caveats to my view. It may take awhile before I am satisfied with the small to modest-sized opera orchestras in the pits after hearing Puccini’s La Fanciulla del West played by an eighty-piece orchestra on stage. Also, balance my remarks with my wife’s opinion that the music was fine and did support the story. We also have to give Mr. Rovaris some points for being a Donizetti enthusiast. He was born in Bergamo, Italy which is Donizetti’s hometown and returns there every year to lead a program honoring him on Donizetti’s birthday. So, I undoubtedly got a genuine Donizetti, if not the sound I like. The Fan Experience: There are two more performances: September 28 and 30. The auditorium in the Academy of Music has been renovated; the new seats are comfy and give more legroom. We had good center orchestra (Parquet) seats, but our view was partially blocked by tall heads in front of us, just the luck of the draw. The front row seats in the Parquet Circle and Balcony looked pretty appealing. For Swings, we stayed in the Klimpton Palomar and for Lucia the Marriott Fairfield Inn and Suites; my wife had free nights coming at both. We had a spacious room at the Palomar which is well appointed in an historic building and offers a free wine tasting in the afternoon. The room at the Fairfield was quite small but charming in its own way and came with a good buffet breakfast. We enjoyed both hotels and both were within easy walking distance of the venues.